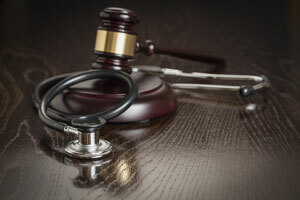 Most medical malpractice cases depend on expert testimony to establish three elements: the appropriate standard of care, the breach of that standard, and the injury caused by that breach. In Shackleford v. Lewis, the Kentucky Supreme Court considered whether expert testimony was needed to prove that a brain injury was caused by delayed treatment of a stroke when an expert testified that the standard of care was breached by a failure to diagnose the stroke shortly after it occurred. David Shackelford sued a hospital and Dr. Paul Wesley Lewis, an interventional radiologist, for medical malpractice in Boyd County, Kentucky. Shackelford saw Dr. Lewis after being referred by another physician to confirm a provisional diagnosis of systemic vasculitis. Dr. Lewis performed a cerebral angiogram after informing Shackelford that strokes are a known risk of the procedure. While he was in recovery, Shackelford noticed white spots in his field of vision. After 30 minutes, the white spots disappeared and Shackelford developed a headache. Shackelford advised nurses about his symptoms and was told that they are common aftereffects of an angiogram. The nurses gave Shackelford pain medication. After monitoring his condition for eight hours, the hospital discharged him. As he was leaving the hospital with his wife, Shackelford became disoriented. He returned to the hospital the next morning. An MRI revealed evidence of a stroke. Expert testimony suggested that Shackelford’s brain had “aged” about 40 years after his discharge. Shackelford retained Dr. Michael Khoury, a vascular surgeon, as an expert witness. In his deposition, Dr. Khoury testified that he found no fault with the decision to perform an angiogram or with the technique used to perform it. Dr. Khoury’s criticism focused on the lack of response to Shackelford’s complaint of white “floaters” in his field of vision and of a headache, both of which he regarded as symptoms of a stroke. He testified that Dr. Lewis and the hospital should have performed an immediate MRI and, after discovering evidence of a stroke, should have commenced oxygenation and blood pressure management to contain its effects. When asked if the results would have been different if Shackelford had been treated immediately rather than discharged, Dr. Khoury testified that it was impossible to know. The hospital and Dr. Lewis relied on the expert testimony of two neuroradiologists, Dr. Peter Pema and Dr. Gregory Postal. They both testified in depositions that the delay in treating Shackelford was not a substantial factor in causing his injury. On cross-examination, Dr. Pema agreed that the brain ages 3.6 years per hour after a stroke, that “time lost is brain lost,” that the most effective treatments need to start quickly, that patients who are treated within the first 90 minutes of having a stroke show the most improvement, that a 12-hour delay before treatment is provided is a relatively long delay, and that if failure to recognize the symptoms of a stroke causes a delay in treatment, the delay will likely be detrimental to the patient. The trial court ruled that Shackelford had no proof that his injury was caused by the negligence of Dr. Lewis or the hospital. Dr. Khoury’s testimony was sufficient evidence that the failure to diagnose Shackelford’s stroke soon after the angiogram constituted a breach of the appropriate standard of care. The court was not satisfied, however, that the expert evidence would have allowed a jury to conclude that the breach caused Shackelford’s injury. Shackelford pointed to the testimony of Dr. Pema to satisfy the element of causation. Shackelford argued that it is reasonable to infer from Dr. Pema’s testimony about the need for prompt treatment that the delayed diagnosis caused Shackelford’s brain to age more than it would have aged if the diagnosis had been made promptly. The trial court, however, concluded that no expert testified that the delay caused an injury to a reasonable degree of medical probability. Since that is the Kentucky standard for expert medical opinions, the court granted summary judgment in favor of the defendants and dismissed Shackelford’s case. The Kentucky Supreme Court reversed the summary judgment. It noted that Kentucky law does not treat the phrase “reasonable medical probability” as “magic words” that must be uttered before a jury is allowed to consider an expert’s opinion. In any event, the court resolved the appeal by concluding that, given the expert testimony establishing a standard of care and a breach of that standard, no expert opinion was necessary to establish that the breach caused Shackelford’s brain injury. While expert testimony of causation is necessary in most medical malpractice cases, it is common knowledge that after a stroke, “time lost is brain lost.” A jury would not need the guidance of an expert to understand that delayed treatment of a stroke harms the stroke victim. In a footnote, the court noted that “time lost is brain lost” has been used in public service advertising by the American Heart Association and the American Stroke Association. This may be a unique case in that medical advertising supplanted the need for expert medical testimony. Moreover, the court concluded that even if expert testimony was necessary to establish causation, Dr. Pema’s testimony did so. Since Dr. Pema reaffirmed the common understanding that delayed treatment of a stroke is harmful, the court regarded that testimony as corroborative of causation. The Kentucky Supreme Court reversed the summary judgment and remanded the case for trial. If the case does not settle, Shackelford will have the opportunity to let a jury decide whether his stroke diagnosis was negligently delayed and, if so, whether that delay caused or worsened an injury to his brain.